Black accents when strategically placed are God’s gift to women. They’re not only flattering for all body types but they provide great contrast as well, making any look stand out instantly. It’s such a powerful color, don’t you agree? Take my outfit for example, without the black accents, my look wouldn’t be as strong. I love all the pieces I have on here! 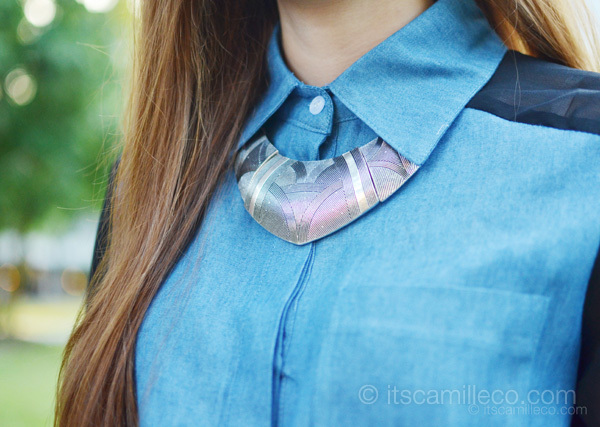 Denim + sheer sleeves, metal necklace, tribal skirt and attention-grabbing heel-less shoes! With their powers combined (yes, this line shamelessly takes inspiration from Captain Planet, I’m corny like that har har), it’s hard not to make a statement! Your always be our darling..
Where can I find the skirt? It’s lovely. Hi ate camille :) where can you find vishose? dba may sapatos ring ganyan si laureen? That skirt does look like all the powers combined. Earth, wind, water and fire. Incredible, awesome and amazing shoe. your shoes! I really wanna try them. but I have to save money first. haha! love your skirt. omg, can you walk on these shoes? camille, i’m officially a fan! i’m from canada and recently stumble upon your lovely blog & have been hooked since! you and your styles are both gorgeous! this look is rockin’ for sure! This is really a statement whoooaaa! Oh and those fantastic shooes. Gotta have ’em! Aha ..superb *jaw-dropping look, as always. You look amazing! I really love the skirt. Such a great print. .. and i totally DIG the skirt! How could you always pull everything you wear? hi camille!i super love your sense of fashion! Ms. Camille! Super edgy shoes po! Haha. You always surprise you readers. Hello Camille, i love your elegant yet edgy style. Just recently discovered your blog, love from Malaysia! i love your skirt Miss Camille! What I love the most with you is your IMAGINATION. Your not afraid to experiment, to mix n’ match clothes that normally doesn’t go well together. hi miss camille! can you post a picture with a smiling pose, cause I’ve been imagining how you look with so smiley pose. I haven’t seen one like very happy and smiling :) just saying. love you blog! OMG this outfit is off the hook! :D I love all the outfit’s components and with their powers combined you’re a fashion forward superhero. Yay! Thanks Marnelli! Haha! I like the sound of that! Thanks Marge! Hindi naman :) Kaya naman! ang gandaaaa! 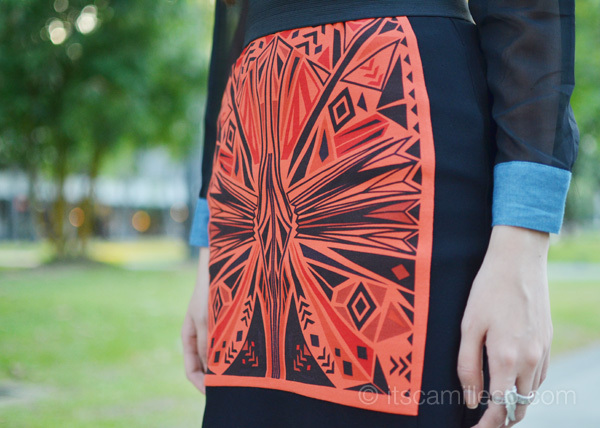 i love the tribal feel of the skirt – it’s almost like a painting or a scarf. i love the top too – it has the same vibe/silhouette as the skirt. definitely one of my favorite looks of yours, because i can see myself wearing this outfit. ok, but honestly, the shoes are just for photo-ops, right?! heehee! Haha no naman, I wore them the entire day :) Thanks Dianne! omg love the shoes~ but how you walk in them?? How much do your shoes cost?It’s so unique and beautiful! ..xenxa n po..too much statement ang nalagay ko..hha..sinulit lng po..haha.. Thanks Joy! Ano ka ba! Why are you nervous? :) I call all my favorite things my babies, usually shoes I guess. Congratulations for a wonderful job there! I don’t like the shoes…so strange! Love the shoes Ms. Camille! Thanks Desiree! I don’t know! Haha! I don’t workout. I’m just really lucky my mom’s genes were passed on to me. Thanks Mira! These are okay, unlike the Guiseppi Zanotti ones, I couldn’t stand in them! an outfit that seems “off” for others only makes camille co outshine them all. How are you, Miss Co? Take your time for us to miss you oftentimes, dear. :) You seemed to be so hardworking and busy but you always inspires us with these outfits you’re wearing. Wow, it’s my first time commenting on your blog post miss Camille. And I must say that you’re so pretty and looked like Yoon Eun Hye :) I admire your style! Hi Camille! Nice shoes but is it comfy or can you actually walk with it? Thanks Michi! Yes they are, in fairness! Thanks Barak! I’m sure some day! Hi Camille! Hindi ba mahirap maglakad sa ganyang sapatos? love your combination camille! wait wait, are that shoes really comfy to wear? I was too but they’re actually stable :) Thanks Quennie!